Labels. I loathe and reject them! They are so limiting. The smart one. The athletic one. The workaholic. The baby of the family. Breakfast. Lunch. Dinner. That’s right. I hate labeling everything including meals. Boring! And limiting! Breakfast does not have to be oatmeal. eggs, toast, bagel, or cold cereal. These foods can be eaten any time of the day. And if it’s last night’s leftovers for breakfast who cares? There is nothing wrong with chicken, rice, and broccoli for breakfast. If that is what sounds good, go for it. Dinner has to be a big hunk of meat and a couple of side dishes? Nope. Not in my book. Sometimes a bowl of cereal is perfect for dinner. Sometimes eggs and toast work. My youngest son’s favorite dinner is breakfast! For many years his special birthday dinner request was breakfast, or what some would label as breakfast food. I am going to tell a story through pictures. It is the story of a meal. But I will not label it. And I will not reveal what time of day I enjoyed this meal (which, by the way, features several servings. I only had one!). I will toss a caveat in saying that it is not a story for the faint of heart. It is of adult nature….it features…dare I say it….bacon and bacon fat. Totally obscene! Outrageous! But it is moderation in the use of the fat that allows my conscience to let this dirty little secret out. 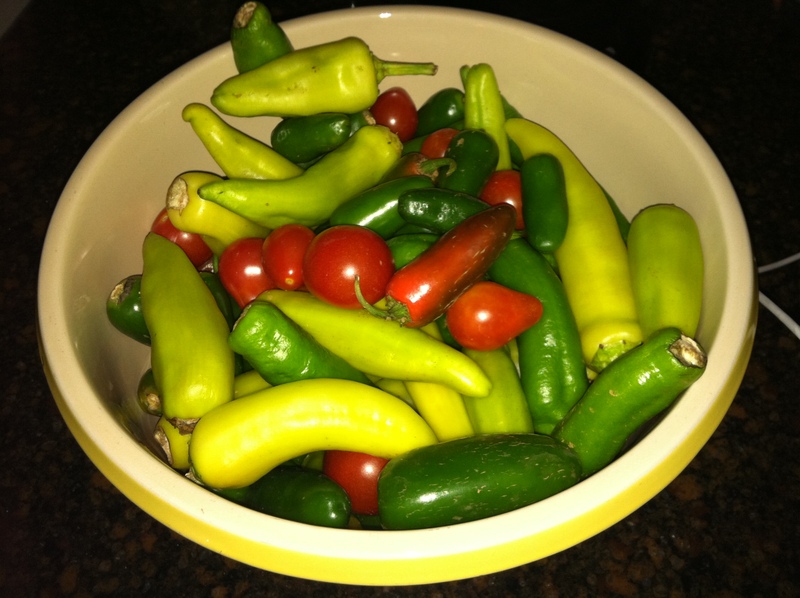 Lucky for me I have friends who have what I lack…namely a green thumb. This bowl is full of fresh peppers and tomatoes. I was the lucky recipient of this lovely fresh bounty, and I let it inspire me. It took me to a very unexpected place. I began my homage to these fresh ingredients by frying up some bacon in my beloved old cast iron skillet. While the bacon was crisping, I started cutting up the peppers and tomatoes. 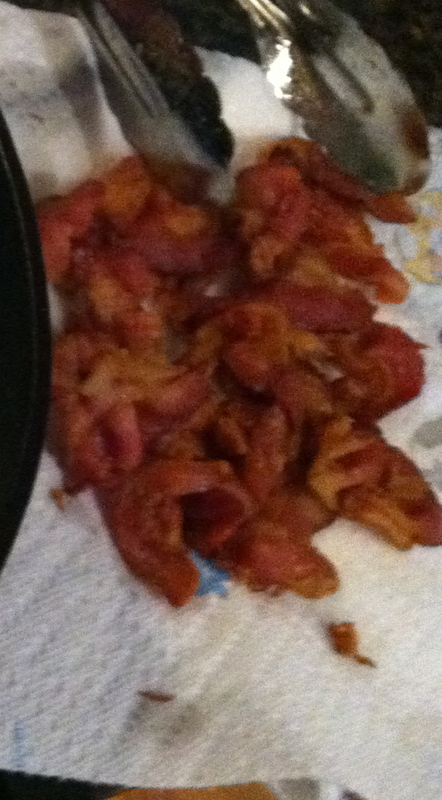 When it was done, I scooped out the bacon to drain on paper towels and disposed of most of the bacon fat in the skillet. I left a bit of the grease in my skillet though. The aromas in my kitchen started deepening, layering. Man, was I hungry now! 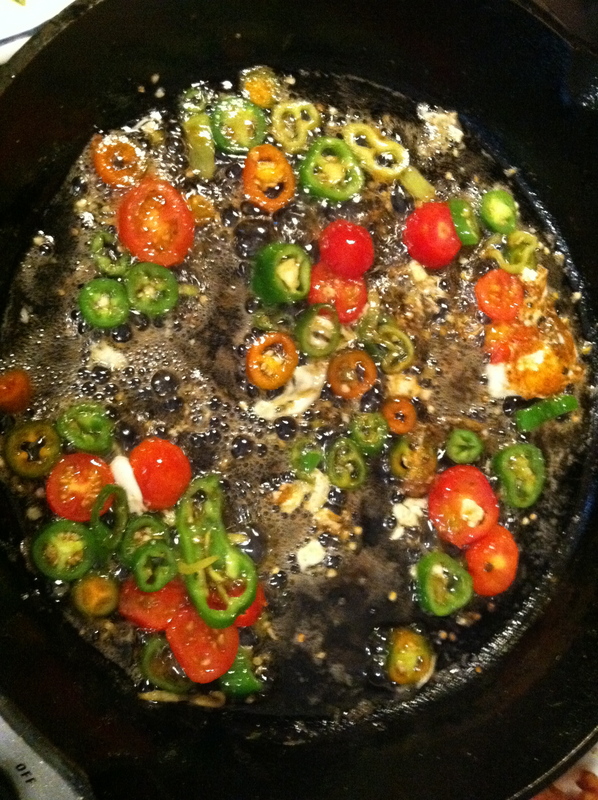 I tossed those fresh peppers and tomatoes into that bacon fat. Yes, that’s what I said. Right into the fat. Well here is where I kind of compounded the naughty factor. While the peppers were frying up I went to the fridge and hung on the door. Hunting. Digging. Then I popped to the pantry. Nope…nothing there…went back to the fridge. Here comes more of the naughty…I was seriously misbehaving with that bacon grease! 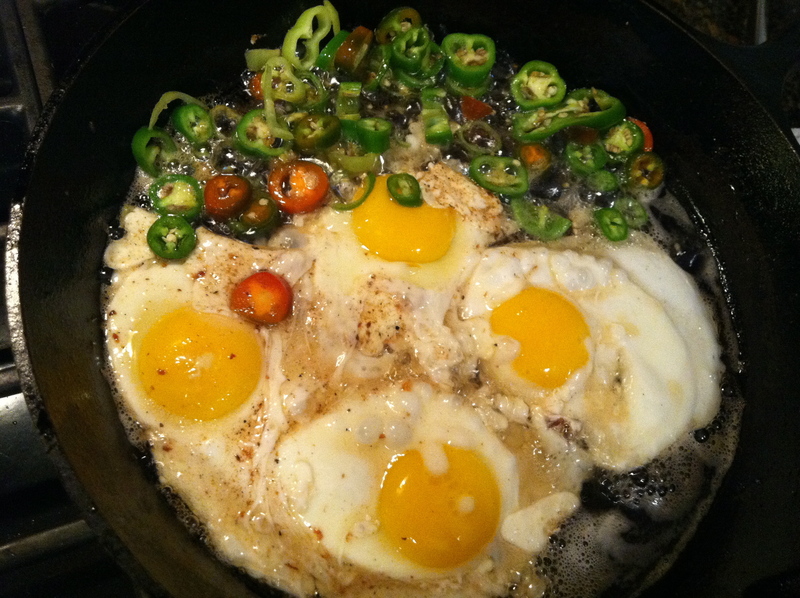 Peppers to the side…eggs in front! I pushed the veggies aside and tossed in eggs. Frying eggs in bacon fat. Yup…I warned you! Totally obscene! And completely delish! But my conscience would not allow this dish to be totally devoid of some sort of nutrition. So I made some whole grain toast. No butter. 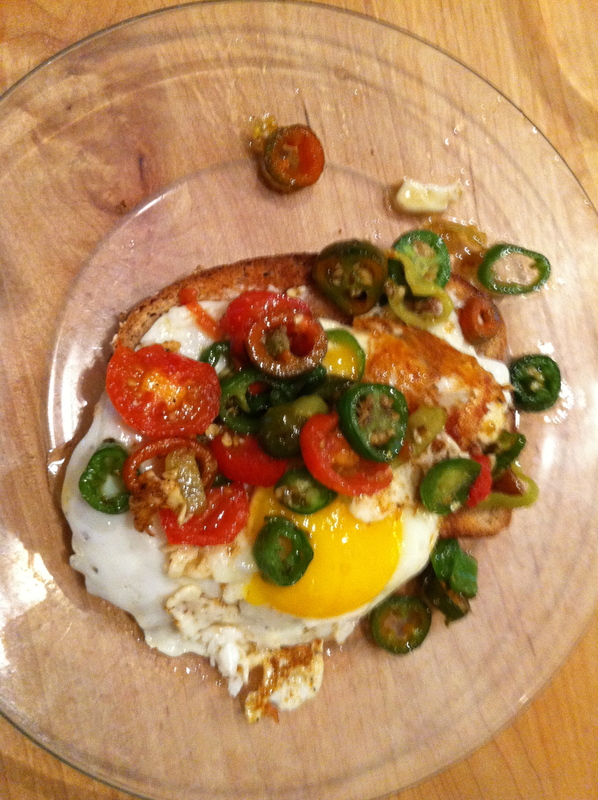 Next I just tossed eggs, peppers and tomatoes on the toast. The bacon was on the side. Fabulous! I will not label this meal, nor will I reveal the time of day that this meal was consumed. Let me just say that it was amazing! I cook with bacon grease maybe once or twice a year. I love great food cooked in different ways. And in moderation, I think that everything can be enjoyed. As I said, I only cook with bacon fat occasionally. This dish was certainly worth the wait..and totally label free.